Yes, they really have made it to Sri Lanka. I was dubious at first since the signage had a different logo than the one I'd last seen in Canada eight years before this, but alas, I believe it's the real thing. 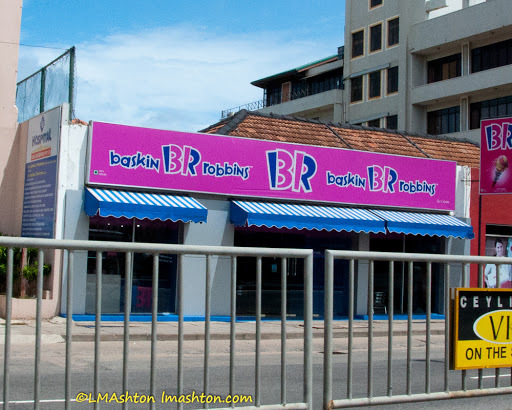 Because, yes, I did check the Baskin Robbins website later to check out the official logo, and alas, it matches. Seriously. Baskin Robbins. In Sri Lanka. Sadly, it wasn't up to snuff. Ice creams were incorrectly labelled. And not just one or two, but around a third of the ice cream flavours. And there were the empty sections and the duplicated ice cream flavours, so really, there were about half the flavours there should have been. They never have all 31 flavours? What’s the point, then? I thought 31 flavours was their tagline. I’m sorry to hear that. We used to have a BR on base, but it closed down; too expensive for the quality provided.